What our customers are writing about us! My brother recently was in Marine "boot camp" at Camp Lejuene, NC. We enjoyed reading letters from him, how much he ENJOYED it, but there was one that particularly stood out... towards the end of one of his letters he repeated the mantra "There's no place like home, there's no place like home, there's no place like home....I guess combat boots don't work like ruby slippers!" We got a chuckle out of that! A friend of the family made him a pair of "ruby combat boots": they looked so fantastic that I designed and put together a case for them. Everything was finished and put together in time for our "Christmas in February" with him upon his returning from Camp Lejuene. He got such a kick out of the whole idea, he said it was probably the best thing that anyone had done for him. He was talking about when he finally moves up in rank and has a desk job the whole display will be sitting in his office! Thanks for making the plate for it! The price and speed at which it was delivered was incredible! Where one of your plaques went to; bottom right hand corner. 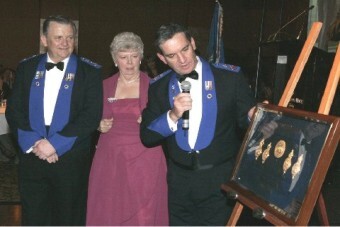 Commissioner of Police in Australia's retirement. (NFP) last year. OK...thanks. AND FYI....the gift recipient LOVED the desk name plate. She gets many compliments on it....it's lovely! Thanks so much. I was happy to find you and will let you know of any other needs we have. Being born and raised in Michigan it's nice to do business with some "folks from back home." The person I gave it to (it was a birthday gift) was so impressed by it. Your craftsmanship is excellent. I was just telling a co-worker how great my invitations came out. Using the embosser that I ordered from you really set them apart from all of the rest. It was very kind of you to follow up and as soon as I find a need for additional products, I will certainly contact you. The customer service, follow -up, and turn around time was absolutely fantastic. For a frantic and busy bride, that is exactly what I needed. Thank you so much for your e-mail. The embosser that we bought from you was a Christmas present for my son-in-law. And, he is absolutely thrilled. I did the design and you folks helped me to make sure it would work well. Please extend my gratitude. As of right now, we are not planning another one in the near future, but I plan to make one to emboss my artwork (drawings) later in the year. Rest assured, when I do, I'll call you first. If you ever have a need for a reference, please do not hesitate to use me. 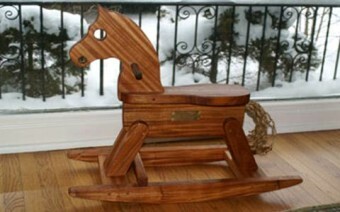 Attached are pictures of the heirloom rocking horse I built for my grandson, on which I used the engraved plate you made. Thank you so much - what prompt & wonderful service! I lost both my "Big Dogs" this past year and want to add Moose to the memory bench I had purchased for Maggie who passed first...thank you for helping me give them a loving tribute.